A walk on the wild side can become the genesis of an endearing bond. We explore some exotic species that make wonderful pets and conversation points. Taming the shrew may be easier than you imagined. There is a compelling romanticism linked to all things exotic, as seen in the western world's obsession with the orient's spiritual practices or our fascination with occidental fashion. The craze spills over into pets too, where the unfamiliar inspires awe. Whether it's just a new variant of the ancient itch to tame the wild horse, an appreciation of the diversity of nature, or the desire to show off one's wealth and power, people take pride in acquiring exotic pets. Aptly titled 'gentle giant', the bird disguises both its fierce strength and calm conduct in its beautiful cobalt blue body. Native to central and eastern South America, it has a wingspan of more than 4 ft which makes it the largest parrot in the world. Its strength can be gauged from its powerful grey black beaks which can snap metal in seconds,making it necessary to be housed in relatively large stainless steel cages (at least 5'x4'x6'). An intelligent and interactive bird, it enjoys learning tricks like riding parrot bicycles and parrot wheel barrels and entertaining an audience of its own. Since it's a high energy bird, it requires a high carb diet including Macadamia and Brazilian nuts, along with coconuts, fresh fruits and vegetables. Besides that, it is also advisable to keep the cage stocked up with chew toys, which will help exercise its beak and vent out all that excess energy. Although it is docile and playful in temperament, if you leave it alone or cage it for too long, it may become irritable and use its strength in destructive ways. Thus, constant care and attention is pivotal. Price: Rs 7 to Rs 11 lakh. In ancient Portuguese, fila means "to hold". Thus the name of this dog goes back to the time when Portuguese colonisers used this breed to hold runaway slaves in Brazil. This fierce watchdog is described as possessing the 'Ojeriza' temperament, which in Brazilian stands for 'sharp aversion' to strangers. A descendent of the 15th century English mastiff, bloodhound, bulldog and refeiros, the fila is believed to have inherited from these breeds a loose skin, keen sense of smell, superb tracking ability and an extremely alert disposition. An average fila weighs 90-110 pounds and is about 2 ft tall and is typically fawn, black or brindle in colour. It may be extremely ferocious to strangers, but is docile, obedient, tolerant and very protective of its owners. Its daily diet should comprise about 3.5 kgs of meat and since it is prone to hip and elbow dysplasia; regular exercises are a must. So you'll need a fenced-in yard with adequate room for the dog to run around and keep fit. 1. The Indian Wildlife Act, 1972 makes it illegal to own species found in the Indian wild, but does not prohibit species originating abroad from being domesticated in the country. 2. In case you wish to import an animal, make sure you get a CITES (Convention on International Trade in Endangered Species) clearance. Legend has it that Pirarucu; the disrespectful and taunting son of an Amazon chief was struck down to the depths of the river by the gods and became an arapaima. Owing to this myth, the species is embedded in the imaginations of the local Amazonians and is still referred to by the Brazilians as Pirarucu. A length of up to 10 ft and a weight of over 400 pounds make it the largest fresh water fish in the world. The unpaired fins on its long and cylindrical body set back towards the tail, while the head is flattened with a jutting lower jaw. The front half of its overwhelming body is green while the rear half is reddish with a crimson red tail. 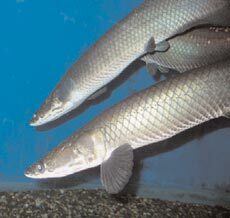 The pet arapaima is friendly, identifies people and feasts on full grown chicken and chunks of beef. Being an Amazonian species, it has the ability to survive droughts and low oxygen levels. The fish is not suited or adapted to life in a home aquarium, unless it's several thousand gallons in size. Consider it as a pet option only if you can afford housing it in a pond, about 12'x24'x36' in size. Also, once you've left it in your pond, the other fish may very well be reduced to fish food. The South American cousin of the camel, llamas are embedded in the cultural evolution of South America. While the western American Inca civilisation herded them for carrying goods and wool, the earlier Peruvian Moche civilisation used them in the death rites of significant people. In terms of physical attributes, the llamas have narrow feet, a short woolly tail and a standard height which varies from 5-6 ft. Conventionally considered livestock, the llamas are warm and friendly and make excellent pets. Given their size, they are only appropriate for those with enough room to house them. Also, since this breed is used to roaming around in herds, it's advisable to provide company to prevent lonely bouts. They tend to pick up small fights to maintain their rank in the herd. The fight generally comprises kicking, spitting, neck wrestling and shoving-fun to watch if you're into feudal feuding. In 1963, Ann Baker, a Persian breeder from Riverdale California noticed the kittens of her non pedigreed white female Persian had a peaceful disposition. Intriguingly, these kittens were born after her cat had met with an accident. In physical attributes, these newly bred cats were similar to rag dolls, as they became floppy on being lifted. Although the ragdolls can weigh up to 12 pounds; they tend to remain indoors which can pile up the kilos. Since they are an easy-to-train intelligent breed, they can be taught to play with chew toys. They are extremely soft and meek in temperament, but like all cats, they leave fur trails and scratch furniture. Austrian zoologist Konrad Lorenz wrote in his book On Aggression (1966) that aggressive tendencies are an essential part of the life-preserving process. He could well be describing the caucasian Ovcharka(Russian for sheepdog) or the mountain dog who uses its fierce temperament to guard livestock in its indigenous regions (Georgia, Armenia and Azerbaijan). With an average height of about 2 ft and a weight of between 99 and 155 pounds, it is one of the largest and most powerfully built breeds in the world. Although it displays a ferocious attitude towards strangers, it's temperament is the exact opposite towards friendly faces. The daily diet should be a balanced one comprising of meat, veggies, rice and wheat. It isn't suited to life indoors and since it dons a thick coat, colder climes are preferred. 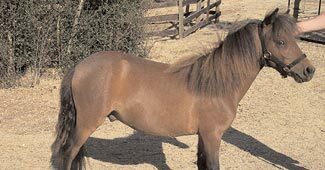 A classic brown falabella in a ranch. This beautiful creature was unleashed on the world by Irish breeder Patrick Newell, who spotted some unusually small horses in the herds of the indigenous Indians in the Pampas in Argentina back in 1868. He chose the smallest ones and began to selectively breed them to create the perfect tiny horse, about 3 ft in height. The practice was carried on by his son-in-law Juan Fallabella and his descendants (who've lent the animal their name) to create consistently small creatures. 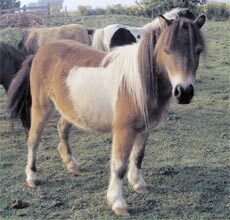 Today's falabella resembles a Shetland pony, owing to its thick tail and mane, but is cleverer and has a betterproportioned body. The foal is just 1 ft at birth and goes up to about 2.6 ft by the age of three. Falabellas are available in various colours. Of a sweet nature, they enjoy being with children as well as adults and can be ridden by small children. They are intelligent and strong for their size and can be trained to do many things. The bearded dragon perched on a branch. For about 60 million years, life forms in Australia evolved in isolation from the rest of the earth's landmasses and hence gained bizarre attributes. The bearded dragon is a testimony to this. Originating in the woodlands and rocky deserts of Central Australia, the creature is true to its name and has a spiny beard that it uses in defense. With a broad triangular head and a flattened body, it makes a hardy pet that reaches approximately 1.5-2 ft in length and 350 g to 600 g in weight. Since it is omnivorous, it feeds on live prey including crickets, mealworms, wax worms as well as vegetables. It is a calm, friendly and easy going pet that enjoys company. It is a tropical animal, that needs temperature controlled terrarium of 35 degree Celcius to 40 degree Celcius for which thermal heating pads are required. If renowned British natural scientist Edward Bartlett is to be believed, Indian women of Peru made pets of marmosets and it was mass migration of tribes in the middle of the eighteenth century that brought the species from the New World (the western hemisphere) to Europe. However, these were not recognised by naturalists until the eighteenth century. About 20 cm in length, the marmosets are the smallest monkeys in the world. Unlike usual monkeys, their tail is not prehensile i.e. it cannot be used as an additional limb and is about 6.6" to 9" long. They make affectionate and playful pets and cherish and clasp your fingers just as a baby would. They are easy to toilet train and hence can be let loose around the house. Still, if you plan on caging them, make sure the cage is at least 3'x3'x4', which is large enough for them to move and play. Their diet includes fruits, chopped broccoli, nuts and warm milk. They are prone to human diseases like tuberculosis, gastroenteritis and conjunctivitis, but respond to human medication.